Every year, our Band Boosters non-profit parent organization buys thousands of pounds of conventional and organic peaches directly from two family-owned orchards in the Palisades area. We also buy pears. This year, our grower lost his entire crop of conventional peaches, raising the demand for organic peaches. We are supporting this family farm through this period by selling their apples. Our growers are also popular vendors at the Boulder Farmers Market and the Lafayette Peach Festival. Last year, I stepped into this fundraiser gingerly and tentatively. Fundraisers are always polarizers. There are those who whip out their check books to buy whatever your kid is selling and then there are those that give you a lecture. I've been on both sides myself. When the product being sold is not one I care for, like cookies, processed foods, wrapping paper, etc., I write a check directly to the school or group. Usually, schools and kids raise pennies to the dollar and a middle-man takes most of that commission. That, however, is not the case with our peach fundraiser as we buy directly from the growers. The fruit is tree-ripened and transported in their trucks to our high school's parking lot. That's how direct it is. The school administration is not involved and all commission raised is put directly into our marching band's general fund, with a portion going to the fundraising student's account. This fundraiser helps close the gap between the funds school district gives us for our marching band (less than 1% of actuals) and the actual cost. Parents work hard behind the scenes to make this happen. This is our biggest fundraiser and we're always sold out simply because the peaches are the best anyone has ever eaten! Parents of kids in competing marching bands buy from us because they depend on us for their summer fruit! That was one of the best things I heard this summer. We eat them standing over the kitchen sink. They are that juicy. These peaches are now my Alphonso mangos. That last bit might make sense only to an Alphonso-mango lover. 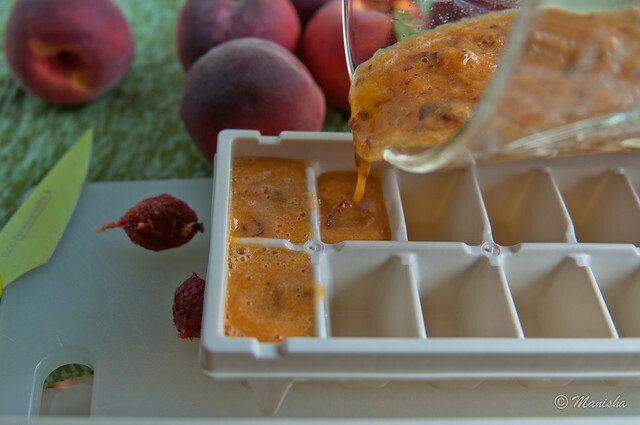 pureed the peaches, skin-on, poured the puree into ice-cube trays and froze them. I am the Freezer Queen. While I love to can, I prefer to freeze more than can, especially when it is fruit like peaches. This will be the third year that I can my own tomatoes and other savory things like salsa, over jams and preserves. We do not eat much sugar and our consumption of fruit preserves is even lower. But these frozen peaches? Oh my! I caramelize the frozen slices in a little pat of butter on a cast-iron griddle and serve them over pancakes through winter. Or on salads. Or in an after-school smoothie. 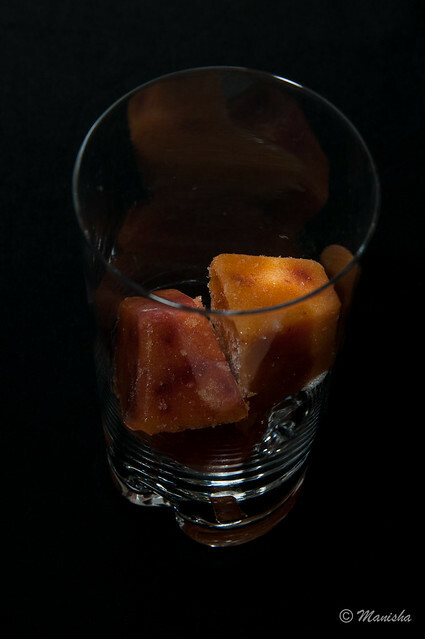 I like to stack the pureed peach ice-cubes in a tall glass and pour chilled sparkling water over them. This frozen puree can also be thawed to make a quick peach sauce but I've never quite done that yet. I hardly ever buy bottled juice, sugary sodas even less. If I do buy juices, less than one third of the glass is filled with juice and the rest with still or sparkling water. 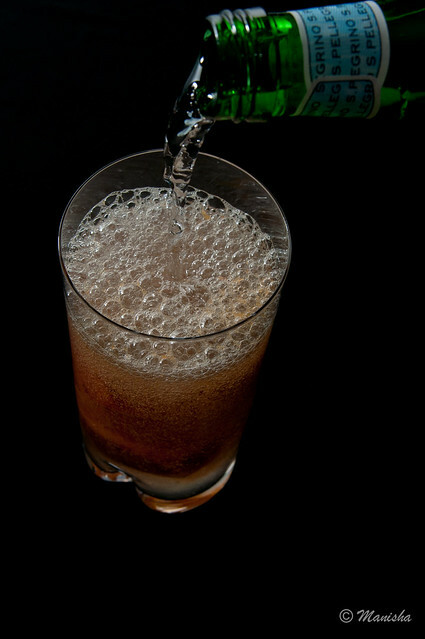 Our taste buds are now accustomed to this level of sweetness in our drinks. 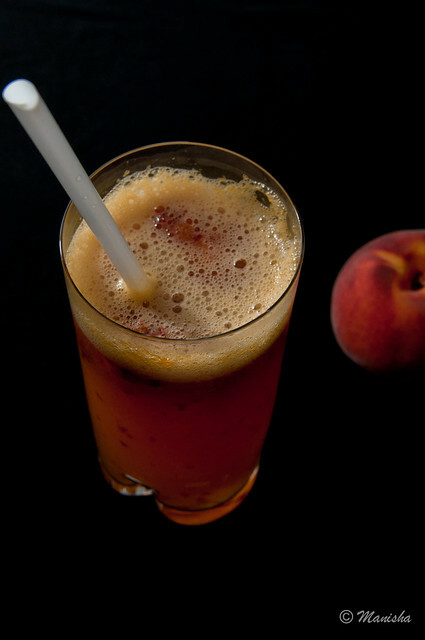 If you like your drinks sweeter than we do, you might want to add some simple syrup or Stevia or a sweetener of your choice to this peachy drink. If you, like me, have the good fortune of excellent organic peaches grown in family-owned orchards, and are wondering what to do with this Colorado gold, consider these two quick methods of preserving peaches through winter. You won't regret it, I promise! How I love this fruit!!! This is great. Good Luck with the classes, will you be recording the sessions? I do hope you will and share them with us. 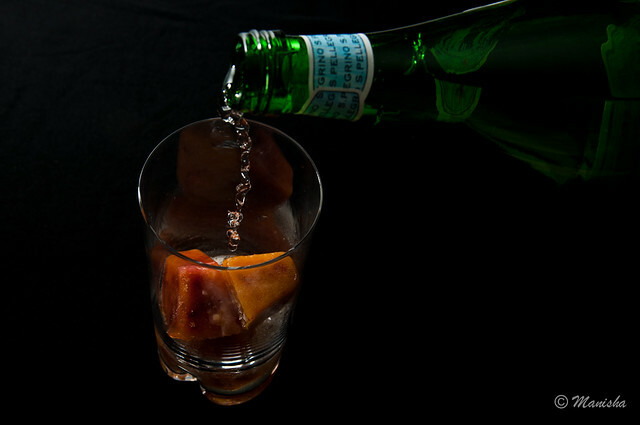 I love the Peach+ sparkling water idea. Very refreshing for summer. I wish I had thought of freezing sliced peaches! I got my hands on a box from a friend's garden - but they ended up as jam! I did distribute most of it though. This way I could have made it last through our winter as well! Next time. What a wonderful idea! Can't wait for our peach season to arrive. I shall raise my peachy drink as a toast to your great idea. Simi, simple but so good! Shruti, me too! Good luck with your event! Manasi, thanks and no, the classes will not be recorded. Anita, there's always next year! 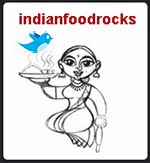 Poornima, thanks! When is your peach season? We are getting our last delivery this week. We are sold out yet again! These are nectarines not peaches. Please let me know if it is a local variety of peach and not nectarine as I understand. sangeeta, these are definitely peaches. 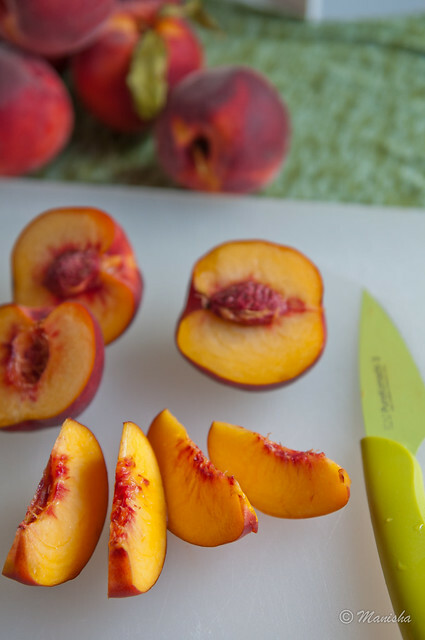 Nectarines are the same species as peaches except for one genetic difference: they have a smooth skin whereas peaches have fuzz on their skin. These had fuzzy skins. Our Band Booster Organization buys these peaches in bulk (thousands of boxes) directly from a Colorado grower in Paonia. 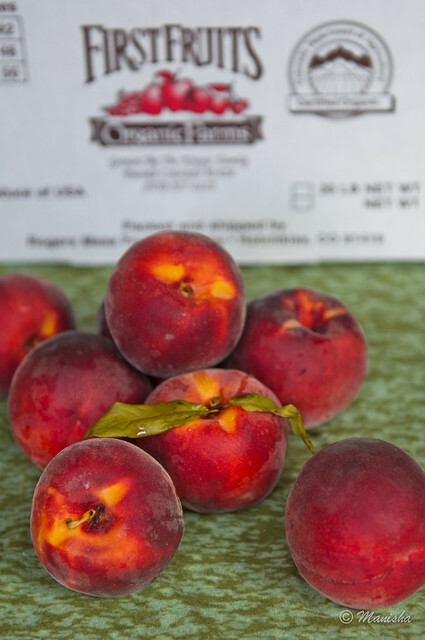 Based on the info from the grower, these are Sierra Ridge peaches (dark color, good flavor, semi-cling/semi-freestone). I hope this helps.